UPDATE: Mitsubishi Motors Philippines just launched it for the Philippine market (1/26). 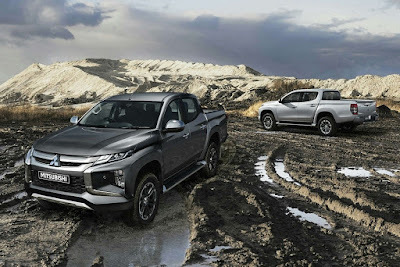 Two months after its global unveil in Thailand last November, Mitsubishi Motors Philippines is gearing up for the launch of the 2019 Strada next week. 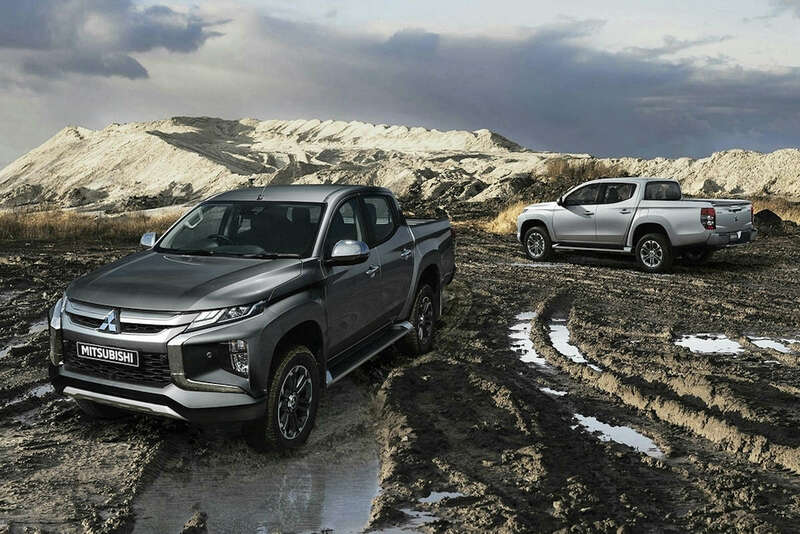 While they’ve been largely mum about the local details, here are some things we’ve gathered about Mitsubishi’s latest offering. It features the second-generation Dynamic Shield Concept fascia which creates an impactful presence. Unlike the Xpander, the Strada’s headlights remain at the conventional location (like the Montero Sport). The large lamps positioned at the middle of the bumper are actually the turn signals and the front fog lights. Rear fog lights are standard. The tear-drop shaped LED rear combination lights are standard on the GLS 4WD and GT models. Two-tone machine-cut 18-inch alloy wheels give the Strada a stronger road presence, at least for the GLS and GT variants. All 2019 Stradas will be powered by Mitsubishi’s 2.4-liter MIVEC Clean Diesel engine (4N15). It has 181 horsepower at 3,500 rpm and 430 Nm of torque at 2,500 rpm. Transmission options (depending on the variant) are a 6-speed manual and a 6-speed automatic. The automatic gearbox offers optimized gear ratios for improved fuel economy and engine quietness at high speed. It also has a Sport Mode for a manual-like driving experience. It’s got Cruise Control for reduced driver fatigue during long distance highway driving. The GT model is equipped with Mitsubishi’s Electronic Dial Super Select 4WD-II. It’s a shift-on-the-fly system that offers 4 drive modes and a center differential lock. Coupled with that is Off-Road Traction Control which improves the Strada’s overall traction based on one of 4 modes: Gravel, Mud/Snow, Sand, and Rock. It adjusts engine output, transmission settings, and braking. The trademark J-shaped cabin continues for the 2019 equating to a surprising amount of interior room despite the Strada’s compact exterior size. The rear Semi-Elliptic Leaf Spring suspension has been improved for 2019 for better riding comfort without sacrificing cargo capacity. The GT model comes with a double-stitched leather seating—the same sort of luxury you find in the Montero Sport. The GT and GLS variants offer front and rear USB charging ports with mobile phone/utility trays to keep everyone’s small knick-knacks organized. The infotainment system still comes from AVT, but does arrive with a Capacitive Discharge touchscreen display, GPS navigation, and reverse camera. The 2019 Strada’s new gauges get a colored multi-information display that shows the drive mode, ambient temperature, average fuel consumption and economy, drive range, mileage, and even a PMS reminder. Oh, and it’s dimmable too. For the GT variant, dual automatic climate control comes standard as is the new vaunted rear circulator. It has a tilt/telescopic steering column. Increasing safety, comfort, and ease of driving at night, the GT also has Automatic High-Beam that automatically switches to low-beams when vehicles are detected ahead and back to high-beams. The 2019 Strada is aiming for top-notch safety and thus, comes equipped with the MASTC or Mitsubishi Active Stability and Traction Control. This allows the Strada to manage engine output, power distribution, and braking force to deliver improved vehicle control, traction, and tracking in all driving conditions. Along with MASTC, Hill Start Assist is standard, but only the GT gets Hill Descent Control. Every seat comes with 3-point ELR seatbelts. 7 airbags are standard on the GT model. The GT also comes with a Forward Collision Mitigation System, a radar-based automatic emergency braking system. When there’s a risk of collision, the system alerts the driver through visual and audio warnings, and pre-charges the brakes. If the driver fails to respond, the system applies the brakes automatically to reduce the severity or prevent the accident. Another Montero Sport technology that’s now on the Strada (at least for the GT) is Blind Spot Warning. Finally, it also gets front and rear Ultrasonic Misacceleration Mitigation or UMS. This means the Strada will now control engine output when it detects an obstacle in front or behind it and the accelerator is abruptly pressed. We’ll have more information for you guys at the 2019 Strada’s launch by next week. The previous designer must have been transferred to other department. Dear Mitsubishi Philippines, please upgrade you Montero Sport GLX into GLX Plus or add features. Please put Smartphone Mirror Link, GPS Navigation, add 2 more speakers to make it 6. Make its (Montero Sport GLX) Audio System Features same as to the other Variants. Better if it will be added with Reverse Sensors.